I’M WALKING DOWN a corridor of the Canadian War Museum, looking for the doorway to the volunteers’ lounge. I walk past closed doors. Fire doors. Elevators. Not sure I’m going in the right direction anymore when I notice an open door. This is different. I stick my head around the corner, about to ask for directions, then realize I’ve found what I’m looking for. Nine men, most of them dressed in blue blazers, are gathered around a coffee table, all looking at a story from the day’s Ottawa Citizen. The conversation is animated. “Maybe he was in Korea later, and they just got the dates wrong,” replies another. The second man is about to respond when he notices me standing in the doorway and stops. “Can I help you?” he asks. As if on cue, the other eight men all turn their heads to see who has interrupted the debate. “Yes. I’m looking for the volunteers’ lounge. Looking for General Withers, actually,” I say, standing uncomfortably as nine pairs of eyes look me over. A man pushes aside the Citizen, with its article about a Korean War veteran, and stands. 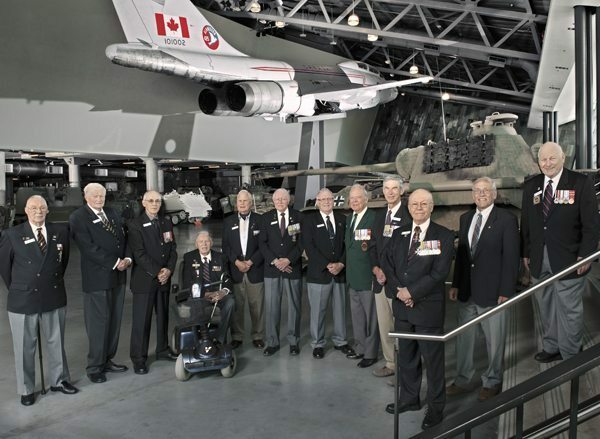 THEY CALL THEMSELVES the A team, the veterans who gather at the Canadian War Museum every Tuesday morning. The youngest is 69. The eldest is 93. They come as volunteers, ready to fan out over the various displays and exhibit rooms and answer questions from the half million visitors who come to the museum every year. Some have been volunteering for more than 10 years — at the old museum on Sussex Drive, now this one. The same bunch every Tuesday. One veteran of the Second World War, five from Korea, a couple from Vietnam, several from various United Nations peacekeeping missions around the world. They run in retired rank from officer cadet all the way to chief of the defence staff, this being General Ramsey Muir Withers, who introduces me to the A Team and asks if I would like coffee. I sit in a chair while the general makes the coffee, and the other eight men lean forward, waiting to be interviewed. “So, it’s always the same people on Tuesday?” I ask. THE CANADIAN WAR MUSEUM has 125 volunteers — either veterans or current serving members of the Canadian Armed Forces — but the Tuesday-morning volunteers have a couple of unique features. One is a former chief of the defence staff (Withers held the position from 1980 to 1983). The other is Hunter Dunn. Dunn is 93 and served for the duration of the Second World War with the 8th Canadian Hussars. He served in the Italian campaign, in northern Europe, in the Netherlands. It is said he has more experience in a Sherman tank than any other person in Canada. He is speaking now, answering my question: “Why did you enlist?” I have asked it of each man sitting at the table, and each answer has been different. 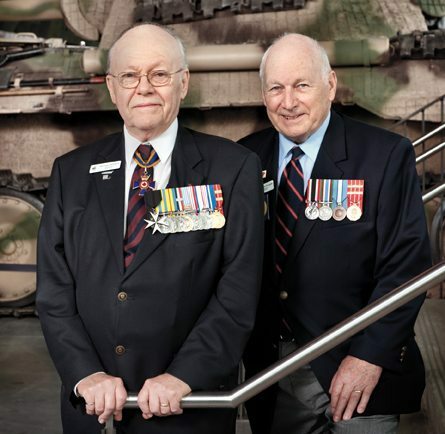 Former chief of the defence staff Ramsey Muir Withers (left), with fellow volunteer J.R. Digger MacDougall, says the veterans feel it is their duty to make sure people truly understand the costs of war. Photography by Marc Fowler. Walter Conrad, retired major, Royal Canadian Dragoons, enlisted because he’s from the Maritimes and the Second World War was “something real, something that was happening around us” when he was a young boy. He also held great admiration for his father, who was awarded the Military Medal for actions at Vimy Ridge. Reg Redknap, retired major, Royal Canadian Horse Artillery, lived in England from 1935 to 1947 and saw World War II first-hand; a combination of adventure, patriotism, and opportunity led him to enlist. The A Team has just been asked another question: “Have you noticed a change in how Canadians view the military?” Once again, we make our way around the table, although this time there is consensus, agreement, nearly identical answers from every voice. “People coming to the museum today — they’re families, young children. It’s not the way it used to be,” agrees John Courtney, retired major, Royal Canadian Electrical and Mechanical Engineers. “There was a real drought,” adds David Holmes, retired officer cadet, Royal Canadian Navy — a comment that brings a surprised silence over the room. As I sit there waiting for someone to speak, I realize, with a sudden awareness that is almost jarring, how difficult it must have been for these men to have given years of their lives — to have risked their lives — in a pursuit that many people once denigrated or dismissed. I AM WALKING THROUGH the Canadian War Museum, a former general — a former chief of the defence staff, no less — as my personal guide. “What did you think of the A Team?” asks Withers. Withers’ parents were born in Scotland, and he speaks from personal experience. Two of his uncles were killed during World War II, and a third was gassed during the war and died shortly after. His father was the only surviving son from a large family, and it was never the same after the war, his family. His father came to Canada to get away from the bad memories, the wasted youth, the lost potential that was the Withers family after 1945. He came for a new beginning, and Canada gave it to him. Withers has always loved this country because of that second chance. He didn’t think twice about enlisting for the Korean War. His country needed him, and he was proud to serve. He was in the signals corps between 1952 and 1970, hauling telephone cable on his back to field artillery regiments, working at night, always wondering if a Chinese sniper was going to find him. Not surprisingly, the Korea exhibits at the Canadian War Museum are his favourites. He shows me the exhibit on the North Star cargo plane, which every Korean veteran remembers fondly, even though many almost became deaf because of it. And the field telephones he used to hook up and maintain. There is an eclectic collection of artifacts in this section of the museum, and he also shows me a typical early 1950s Canadian kitchen and living room. Enlistment posters. The chin-up bars that were used to test the physical fitness of new recruits (“Had to do 15 of those”). Eventually, we find ourselves in front of an exhibit about Hill 677 and the Battle of Kapyong. The battle took place between April 22 and 25, 1951, and is one of the proudest moments in Canadian military history. That spring the Chinese army had started an offensive that overran the United Nation’s front line and left it within marching distance of Seoul. The last line of U.N. defence was the Kapyong Valley, which the Chinese army would have to pass through in order to reach the city. An entire Chinese division marched into the valley on the morning of April 22 and, after a hard-fought battle, forced the retreat of the 3rd Battalion, Royal Australian Regiment. The only thing left standing in the way of the advancing Chinese army was the 2nd Battalion of the Princess Patricia’s Canadian Light Infantry, which had dug in on a hill overlooking the valley. For a day and a half, the Chinese assaulted Hill 677 but were unable to dislodge the Canadians. Although they were outnumbered five to one, the Canadian soldiers forced the Chinese army to retreat — first from the hill, then from the valley itself. “I know people who were on Hill 677,” says Withers, staring at a map of the area. “I can’t imagine what it would have been like for them that evening. They must have thought they were all going to die.” He pushes buttons on the interactive display, lighting up the Chinese Army divisions and how they advanced down the valley: the Australian battalion on Hill 504, the Canadians on Hill 677. It occurs to me, as he stares at the blinking red lights, his back ramrod straight in his volunteer blue blazer, that the general is remembering a battle he never fought. Standing there, lest he forget.